The European Union cannot meet Britain and agree to a fictitious Brexit, allowing it to preserve the old advantages and get new ones so as not to create a dangerous precedent. Escape from the "prison" failed, and the British will have, losing face, but retaining the wallet, return to the "chamber"
Teresa May, after an unprecedented defeat in the House of Commons on the fateful issue for the country to leave the European Union, miraculously escaped resignation. 432 deputies voted against the agreement concluded by her government about the conditions of a “divorce” with the EU, for only 202. Opposition leader, Labor Party leader Jeremy Corbin did not flinch, saying: "This is a disastrous defeat of the government." After that, he officially made a proposal on the notion of no confidence of the government. But May again managed to resist. 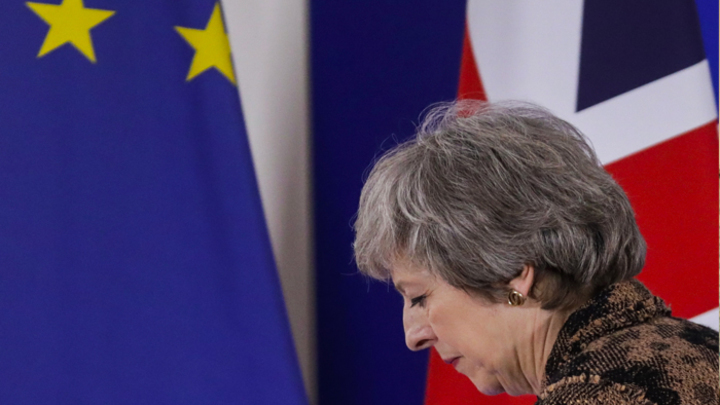 Thus, one and a half years of intense and dramatic negotiations between London and Brussels on Brexit did not lead to anything, although nothing remained until the target date for parting with the EU - March 29, 2019. Moreover, all the remaining options for the way out of the current situation, except one, do not lead anywhere. This is also an attempt by conservatives to change their leader, not bringing matters to an early election. And the holding of these elections with the prospect of a victory for Labor and new negotiations with Brussels, more favorable for London, about the conditions for leaving the EU. All this does not solve anything, since London will not receive better conditions than now. In Brussels, they have already announced that the maximum that the British can count on is delaying with a “divorce” until mid-summer, and no further concessions. This is necessary to ensure that other EU members do not have the impression that you can simultaneously get all the benefits of exit and actual absenteeism from the community. In Brussels, they can not do otherwise, because after Britain, if successful, Poland will go, and after it some other countries that are not satisfied with everything in the EU. Therefore, there is only one way out for the British: loss of face and reputation: to hold a second EU membership referendum and after receiving the respective mandate of voters to remain in the community, to pretend that there was no Brexit, and all this history should be forgotten as soon as possible. None of the serious and major British politician will take the responsibility to achieve this in any other way, apart from the referendum, to “cancel” Brexit. This means that the cataclysms of the coming weeks and months in the political arena of the country will only confirm that there is no alternative to this option. The main problem for the British elite is that the relative unanimity in it, as events in both houses of parliament have shown, is observed only with regard to the need to avoid a disastrous separation from the EU. They voted against a specific draft treaty on withdrawal, but could not formulate an alternative that would also enjoy the support of the majority, as May constantly points out in her speeches. It is this circumstance that makes the growing crisis especially difficult, unpredictable and uncontrollable, capable even eventually of leading to a “tough” Brexit. All other options to break the deadlock are unrealistic. The government will not be able to offer the deputies for three days a new draft deal with Brussels, since May didn’t have any “plan B”, and Brussels doesn’t intend to revise the current draft agreement and does not agree to new negotiations with any British government, constantly reminding the islanders that they leave the EU, and not vice versa. Moreover, even if May managed to impose her plan of “divorcing” the EU to the British Parliament, it would still not really be able to solve the problem of controlling the border between Ireland and Ulster remaining in the EU, which is only delayed until the summer of 2020. But that's not all, because when the “divorce” becomes an inevitable reality, Scotland will rise against it, wishing to stay in the EU. What then will remain from the United Kingdom? Britain will remain with the prime minister, from whom it is impossible to get rid of, but who, like any other politician in her place, is not able to solve the country's most important political issue. What happens next depends on very many factors that are not amenable to account. One can only say without fail that Britain, May and her party can not expect anything good.